This is our last meeting before Christmas so of course we made some Christmas decorations to hang on the tree. 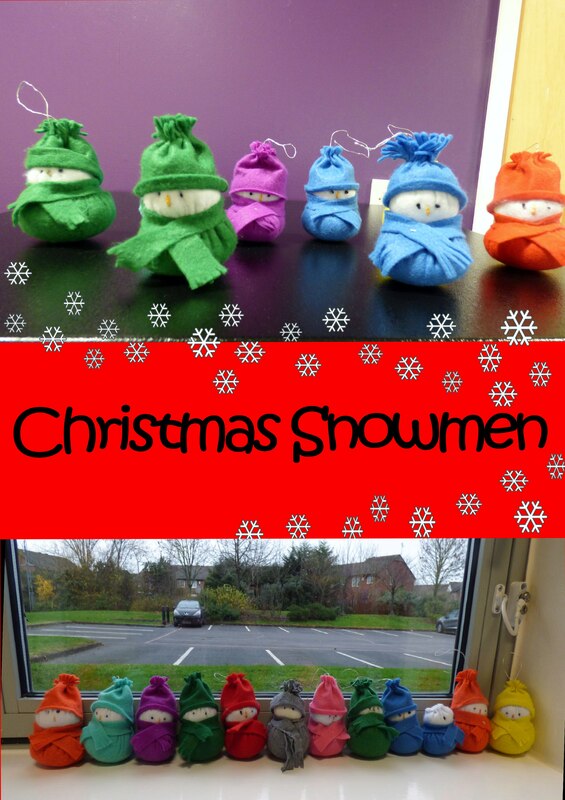 We made some little felt snowmen wrapped up for winter with hats and scarves. These were made from felt circles, stuffed with toy stuffing and have embroidered faces and a cord for hanging them on the tree. During the afternoon we had cake and Christmas presents. Happy Christmas Everyone! Our group of Young Embroiderers were invited to Merseyside EG Winter Fair which was held in Unitarian Church Hall, Ullet Road. We all had a lovely time with lots to see and lots to eat and drink. Some prizes were won on the raffle, and there was an Activity Table where we could make a little bird. A Trophy was awarded to Zoe Lewis as Merseyside Young Embroiderer of the Year- unfortunately Zoe was not present as she was not feeling well, so her sister Esther collected the Trophy on her behalf. We also had a competition to create something using a small purple laser cut shape. We got some wonderful imaginative entries, and the winner, who was voted for by public vote, was Esther Lewis. Congratulations to Zoe and Esther! Shaneka, a student teacher, came to spend the day with us today. She enjoyed her visit and was impressed by our talented group members. We embroidered crazy patchwork bag fronts today, and will see the finished bags at MEG Winter Fair next Saturday, 19th November. We used lots of new embroidery stitches to embroider our bags. As well as chain stitch, blanket stitch and cross stitch, which are old favourites, we learned herringbone stitch, feather stitch, fly stitch and Pekinese stitch. Hope you like our photographs and come to the Winter Fair on Saturday 19th November in Unitarian Church Hall, Ullet Road, Liverpool L17 2AA to see all our work . We had a new member today, she is Evie and is Bella’s friend. Hope you enjoyed the day Evie and return again next month! 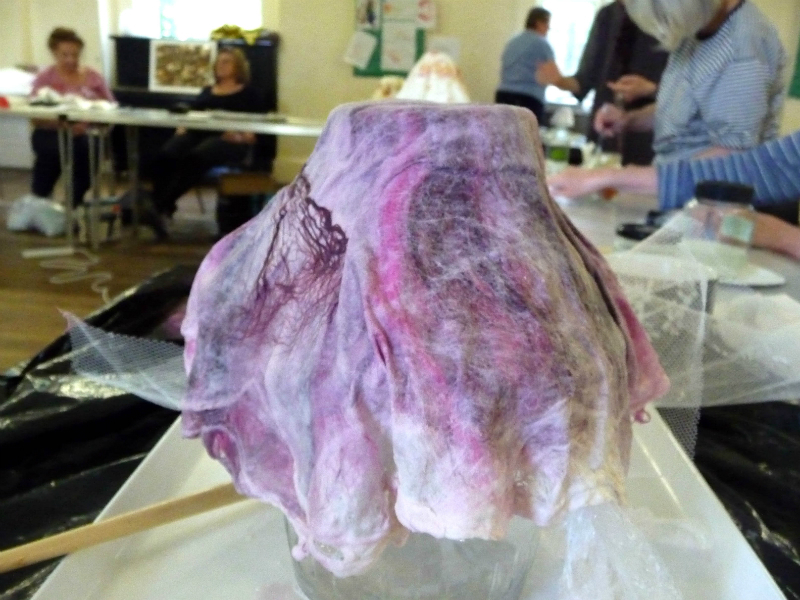 We welcomed our group of embroiderers back today after their summer break. We will spend this session on a tribute to Beatrix Potter who wrote lots of children’s stories including The Tale of Peter Rabbit. 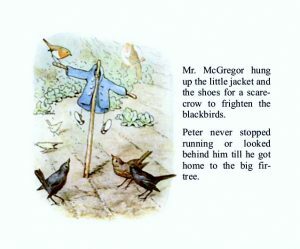 It is Beatrix Potter’s 150th anniversary this year. Our group made Peter Rabbit’s coat scarecrows with appliqué felt shapes and embroidery in chain stitch, running stitch and French knots. Have a look at our photos……..
We have a summer break with no meeting in August. Well, Val is back and feeling a lot better, and we also had 5 new members join us today. We welcome Niamh and Marla, Serena who is Ruby’s sister, Bella and Maddy to their first meeting with us, and hope they enjoyed it and will come again in September. Today we made some fabric flowers and used them to decorate a notebook, then on a hair slide, and also a flower badge. There is no meeting of Merseyside YE in August, so have a great summer break and we will see you all again in September. Unfortunately we have had to cancel this month’s workshop as Val, our YE Leader, is not feeling very well. All members due to attend have been informed. We have an extra meeting next month on Saturday 9th July so we hope to see you all then. Get well soon Val! Merseyside Embroiderers’ Guild held their celebration of 60 years of embroidery- “60 Glorious Years” in Liverpool Anglican Cathedral. Members of Merseyside Y.E. 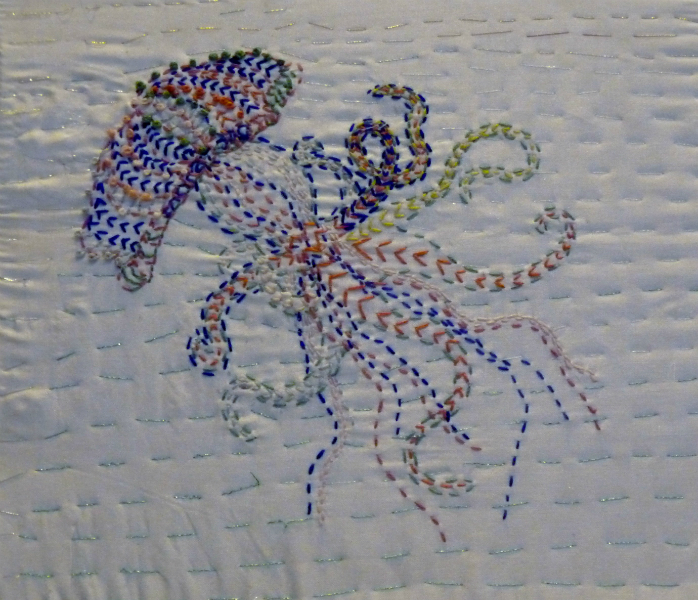 have been making wonderful embroideries for this exhibition for a few months now, and this was our chance to see them. We had lots of compliments from lots of visitors from all over the world. 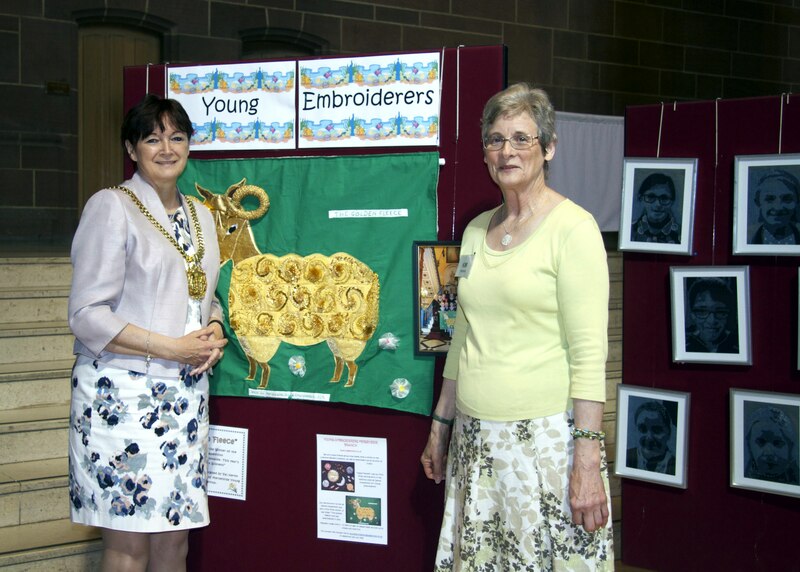 Visitors especially liked the denim portraits and our prize winning Golden Fleece Group Embroidery. On Thurs 2nd June we had a visit from Liverpool Lord Mayor Cllr. Roz Gladden, and she had her photograph taken in front of the Golden Fleece. We hope you all like the photos we have taken of the exhibition, and hope many of you came to visit the cathedral to see the exhibition for yourselves. On 14th May 2016 we were invited to go to the MEG Summer Tea Party held in the Unitarian Church Hall, Ullet Road, Liverpool L17 2AA. A good time was had by all who attended. We had a competition “Decorate a Fan”. All the entries were very imaginative and colourful, and Zoe U. was the First Prize winner- well done Zoe! We wish Ailis a speedy recovery as she has broken her arm. All YE members were presented with a photograph and a certificate as a memento of their recent visit to see the Lord Mayor of Liverpool, and there was an activity table making wire butterflies, a Raffle Stall, and of course a delicious buffet tea. Of course we have lots of photos, so have a look! We were pleased to welcome our YE Regional Representative Vicky Williams to our meeting today. This is the last meeting at which we will be making embroideries for the forthcoming exhibition, so we still can’t show you our work. In May we will have photographs of all the wonderful things we have made! Today we used chiffon and beads to create summer flower pictures, and also worked on our hand sewn embroideries we began in February. Well, nearly a full group today. We are only missing Emma who had a prior engagement- hope to see you next time Emma! We are still working towards our MEG 60 Glorious Years exhibition which begins in Liverpool Anglican Cathedral on 28th May 2016, so can’t spoil the surprise by showing you our work. This month we made a background with ribbons and lace then added embroidery and a feature motif to make attractive pictures- so wait and see! We had quite a small group today, as it is half-term and several of our members are away. However we did welcome two new members, Rosa and Emily, and hope they return to many more meetings. We are still making wonderful embroideries for our exhibition to be held in Liverpool Anglican Cathedral from 28th May – 3rd June, so can’t really show you what we are doing BUT we all used iron-on transfers and embroidered by hand along the lines. Everyone enjoyed this new experience and our two new members made small embroideries to take home using the same method. Remember back in October 2015 we made sweetheart pincushions for UpFor Crafts? Now our YE pincushions are on display in the Hornby Library, Liverpool Central Library, William Brown St, Liverpool L3 8EW from Tuesday 2nd February 2016 – 28th February 2016. We have some photos of the exhibition below, but I hope you will all be able to visit Central Library and see your work on display. Here we are back for another exciting year of stitching. Merseyside Embroiderers’ Guild celebrate their 60th Anniversary this year with an exhibition in Liverpool Anglican Cathedral during June. Of course our Young Embroiderers’ will be adding to the display with lots of new embroidery projects. So today we are embroidering our first project which we can’t show you until the exhibition. We ironed on layers of fabric which had Bondaweb on the back, and then did some surface embroidery. This is the day that Merseyside YE group went to have tea in the Mayor’s Parlour with the Lord Mayor of Liverpool, Tony Conception. The meeting with Liverpool Lord Mayor was arranged to celebrate the achievement of Merseyside YE winning First Prize for the Group Entry in the national deDenne Embroidery Competition 2015 with their embroidery “The Golden Fleece”. We all had a lovely cream tea, and were shown the Lord Mayor’s Chains of Office and also the Chains of Office of the Lady Mayoress, who could not be present today. At the end of the visit our entire group assembled at the bottom of the stairs and had a group photograph taken.